Brown Boots Outfit for Men: Styling outfits has become a necessary way of wearing clothes for men also. Social networking sites have increased men’s fashion awareness among the masses. Boots are the highlight of the whole attire when it comes to men’s wear. Be it combat boots, Chelsea boots, bramble Chelsea or cowboy boots or any other type. Black boots are worn with almost everything but if you want to make a style statement put on your best brown boots. They make you look fashion forward and updated on the latest trends. Always match your boots with belts. Finding the right combination with your outfit and boots is a bit difficult but ultimately it pays off and always stick to your gut feeling. We have collected a few ideas from which you can choose your favorite brown boot outfit looks. When you want to look stylish yet want to wear something comfortable always go for the classic colour palette. The black and white ensemble with a t-shirt and jeans and team it up with brown cow boy boots. Lunch dates which also call for casual dressing can be a bit tricky. 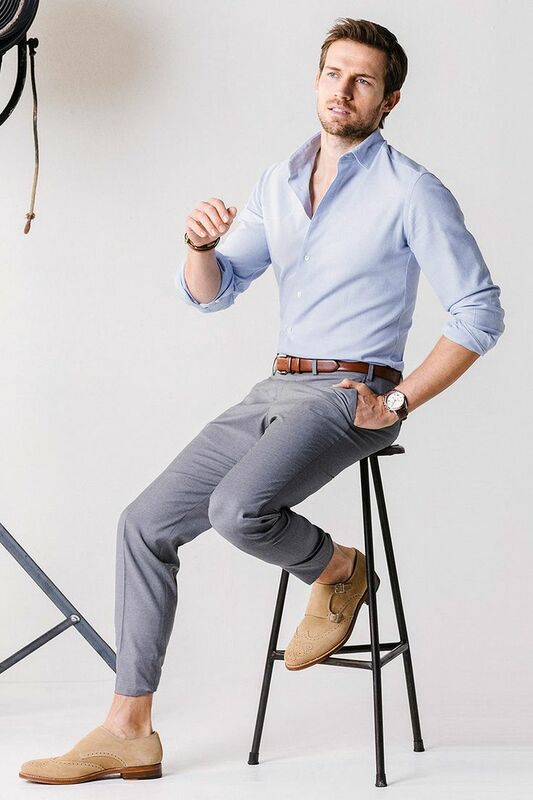 Wear a light colored shirt with grey slim fit pants and boots without socks which is giving a vibe of casual dressy. Go for uncommon colors when selecting your spring combinations. Beige pants are always a good choice in warm weathers and team it up with this cool green collared shirt. Want to take a little risk? Wear this Orange blazer with mustard pants and a blue shirt. brown boots look awesome with this combo. Working in a multinational? You need to have a very nice suits collection. Wear your spring blue suit with bramble Chelsea boots that will make you stand out. An all white is uncommon among men. But warm weathers now call for this fresh look.